mama elephant | design blog: Mama Elephant October Sneak Previews! Mama Elephant October Sneak Previews! Now moving right on to October, we've got a few more holiday goodies for you! As we inch closer to the holidays, aside from cards, tags for gifts are a must too, right? You spend so much time on your cards, why not tie it all together with an equally cute tag? 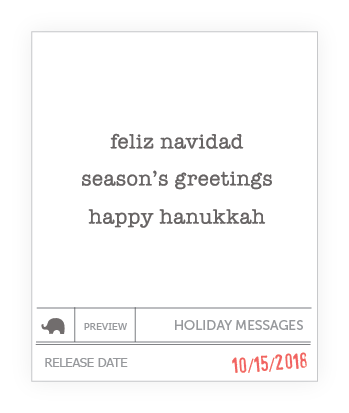 With Holiday Bitties, we've got a bunch of great little images that are perfect to adorn your tags! Stay tuned, because we've got a really cute trio of tag dies that is made just for these! I've really learned to embrace all our cute designs, but deep down, I'm a classic graphic design kind of girl - and Bright Lights speaks to that classic graphic geek in me. Not to mention, it's makes for a really great CAS (clean and simple) card... I'm telling you, this is right up my alley! You can create graphic cards with a pop of color with Bright Lights. Mass produce these, they're really super simple! Luli Bunny is finally back with a yet another adorable set called Let's Go Caroling. Her cute critters are perfect to set up a sweet scene of Christmas carolers! I mentioned in a previous post that our September Release was chock full of images, with minimal sentiments. Finding the right sentiment for a project is always a challenge for me. Now I can easily pull out this classic type sentiment set - with a TON of sentiments to choose from! We've covered most of the classics and threw in some fun ones! Last but not least, the wrap up to the 2018 holiday release ends with wishes for the new year -- Happy New Year Wishes hand-lettered by the talented Paola Esteron. Paola's designs have become a staple in the Mama Elephant collection the last few years! I'm looking forward to seeing Bright Lights and Holiday Bitties! Fab products. Love the images in Let's go caroling. Ooooo!!! I love the light string!! !